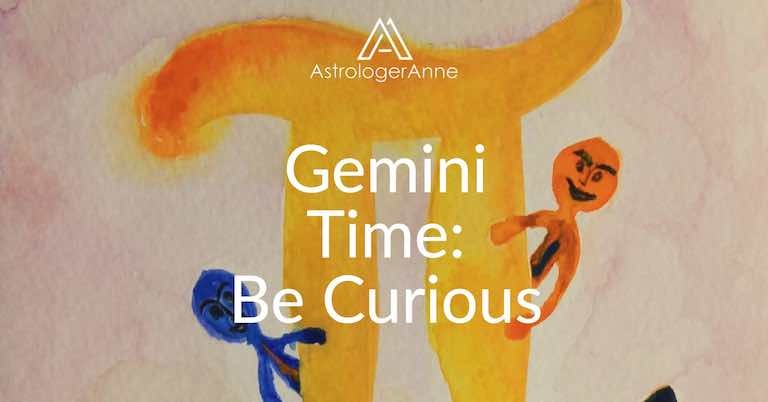 Gemini time brings the time of year that’s good for learning about curiosity and versatility. The Sun leaves Taurus and enters Gemini around May 22 each year. This shift takes all of us from earth to air, from our bodies to our minds: ruled by speedy Mercury, Gemini loves nothing so much as a good conversation (or several, all at once) and entertaining ideas. That makes this a good time to explore your mind, including how you think, how you process information, and how you communicate with others. When the Sun travels through Gemini each year, it brings a light, airy energy that inspires us to let our thoughts take wing. We move away from Taurus’s heavy, earthy emphasis on material reality, possessions, and the body to the Twins’ breezy world of the mind, ideas, and communication of all kinds. Gemini’s insatiable curiosity and mental restlessness push us to get out, taking short trips or detours as the spirit moves us in order to learn new information. By keeping our eyes and ears open, we take in new data; if we keep our minds open, too, we have an opportunity to think new thoughts and entertain new ideas. Gemini time also urges us to see old thoughts or interests in new ways and to re-think anything in our lives that needs freshening or replacing. This sign’s vivacity and love of the new—especially innovative gadgets and technology— give Gemini a youthful and even happy-to-lucky quality, and its ruler, Mercury, gives this sign an agile mind. Although these traits help us stay up to date and try new experiences, when taken to excess they can bring challenges. Youthfulness can morph to immaturity and a refusal to age gracefully or accept adult responsibilities. Gemini’s nimble tongue can cause us to speak thoughtlessly, solely to entertain others, and we may hurt people or harm our reputation by indulging in gossip, lying, or using words as weapons. At its best, though, Mercury can lighten our lives with laughter, a kind word or joke at just the right time, and a wry take on its own all-too-human foibles. Gemini is ruled by Mercury, named for the ancient Roman messenger god who could travel among the heavens, the earth, and the underworld and who got around swiftly thanks to the wings on his sandals and cap. This zippy planet, the smallest in our solar system, orbits the Sun in just 88 days; paradoxically, it spins slowly, making one rotation in about 58 Earth days. Despite its relative brightness, Mercury often is difficult to see because it is so close to the Sun; like Venus, it appears as either a “morning star” just before sunrise or an”evening star” just after sunset, although its period of visibility from Earth is brief. Its orbit is egg-shaped or “eccentric,” unlike that of the rest of our solar system’s planets, which have essentially circular orbits. Gemini’s symbol, the Twins, gives us the image of duality: often, things come in twos for Gemini, such as pursuing two quite different careers at the same time. This quality arises from a natural curiosity, versatility, and love of variety. Like the Twins, however, when Gemini is out of balance, this duality may manifest as being two-faced. Gemini also may alienate others by exhibiting two dramatically different personalities, being scattered from multitasking, or becoming overextended from trying to be in two places (or two relationships) at once. During each year’s Gemini time, we feel intuitive impulses to focus on our mental lives. Each astrological sign is associated with a phrase, and for Gemini that phrase is “I think.” This energy may be expressed negatively via constant chatter, verbal attacks, mental superiority, having an opinion on everything (and forcing it on others), spending too much time with technology, or ignoring life’s emotional side in favor of cold logic. At its best, though, Gemini inspires us to act on our curiosity, explore new ideas, and allow ourselves the spiritual joy of life’s most sublime thought. Tune in even more to the Gemini zodiac sign with the Gemini Meditation.